Finbrella Boat Umbrellas. Boat canopy shade testing outside the Australian Marine Complex, Perth. 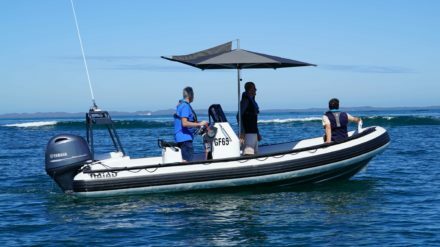 Sea trials for the Finbrella F-280 boat umbrella were carried out in Cockburn Sound aboard a new Naiad rib boat courtesy of Kirby Marine. On a beautiful spring morning the Finbrella demonstrated effortless stability at weaving speeds to 24 knots. 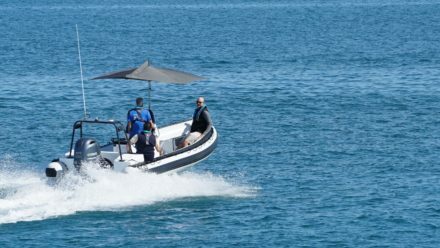 With a simple customized bracket, a range of all marine Recacril canopies, both the 316 stainless centre pole version and the anodized aluminium centre pole versions were put through their paces. 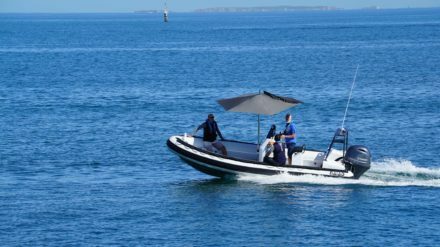 As a bimini substitute passengers and spectators all agreed this boat umbrella is simply the best. Thanks to Kirby Marines' Rob & Adrian for skippering and John at Perth Video Productions for the video & still shots. Finbrella boat umbrella. F-280-S model in burgundy Recacril marine grade acrylic fabric. Finbrella boat umbrella. F-280-S model with 316 stainless steel centre pole. 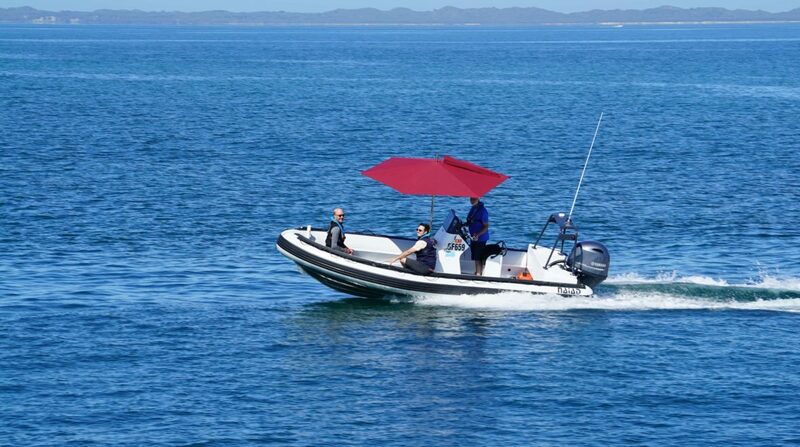 Finbrella boat shade canopy in charcoal tweed Recacril marine grade acrylic fabric. 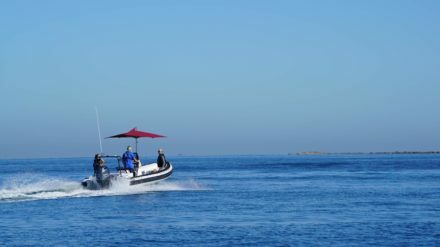 Finbrella boat umbrella with 316 stainless steel centre pole on a Kirby Marine built 6 meter Naiad rib. 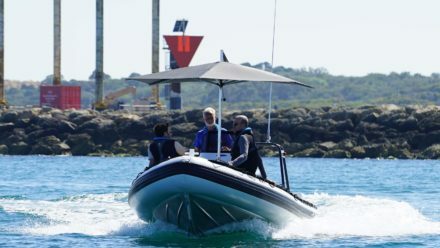 Finbrella boat umbrella testing outside the Australian Marine Complex. Finbrella boat shade canopy testing to 24 knots.